American Expedition Vehicles (AEV) turns JK Jeep Wranglers into howlin' Hemi-powered Brute Double Cab Jeep pickups. They've been promising to bring their magic to Ram trucks for some time; now they've finally brought these unbelievably beastly work rigs to production. That barn-bashing front bumper is all 3/16th stamped steel, can mount a 16,500 pound winch. It'll set you back $2,300 bare and up to $6,438(!) with the full suite of lights and winch hooked up. Iron tow loops give you recovery options, primed powdercoating provides corrosion resistance. And it looks. Awesome. AEV's Ram DualSport Suspension Systems focuses on optimizing geometry and custom shock tuning to deliver the best on and off-road performance. This starts in the front end, where Rams come standard with dozens of different spring rates on HD trucks, depending on powertrain, wheelbase, and more, so offering a generic "gas" or "diesel" spring would have been a huge compromise in ride quality and/or load carrying capacity. AEV retains the factory front coil springs mated to 3" cast aluminum coil spring relocation spacers to achieve the additional lift height. This takes advantage of the full range of factory spring rates while still providing the necessary front end lift. Steering geometry is corrected by way of AEV's High Steer Kit, which includes a custom AEV drag link, AEV track bar and raised track bar tower. This system provides significant improvements to steering precision and handling by correcting the roll center height of the front suspension. Bringing the steering geometry back into factory alignment reduces body roll, bump steer, and roll steer, all major contributors to the loose or sloppy steering and driver fatigue commonly associated with many lift kits. The factory radius arms are repositioned for optimal geometry, moving the axle forward 1". This provides a more neutral impact response, while also allowing more clearance for larger tires. A billet aluminum front driveshaft spacer is included to accommodate the new front axle positioning. The enormous air intake is $420, and AEV's also offering two styles of wheels for $240 a piece. 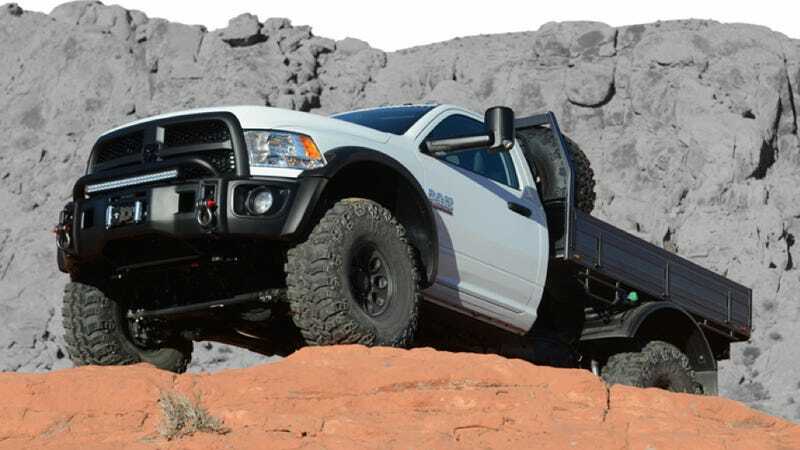 Ram owners with money to burn and serious stuff to drive through can finally buy this hardware the company's been teasing for months on AEV's website. The rest of us will just go ahead and drool from a distance. So far AEV is sticking to 2500 and 3500 Ram trucks, no battering-ram bumper for your 1500 EcoDiesel. Yet.